This electric/air-cylinder operated extra-length sealer, LOS series creates beautiful and consistent seals even for the sealing lengths from 600mm/ 23.4″ to 1500mm/58.5″ with the temperature-controlling ONPUL system. The most prominent feature of the ONPUL System is the ability to set and maintain the ideal sealing condition. ONPUL Sealer controls heating temperature by directly measuring the heater temperature using a low-profile temperature sensor that comes in contact with the heater. You can now complete the heating process at just the right temperature for melting the film regardless of the air temperature or fluctuations in the machine temperature. Seal heating temperature setting range for LOS series is from 60 to 250°C (140 to 392F), while cooling temperature setting range is between 40°C (104F) and the set heating temperature. LOS series is easy to use with the easy-to-operate microcomputer controller. The selection and setting of sealing conditions such as heating temperature, heating time, and cooling temperature is all controlled at the microcomputer controller. Simply press the touch panel buttons for the settings. 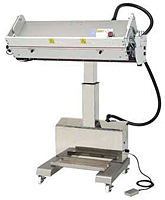 The height of the head of the sealer can be adjusted to suit the package content by operating the buttons on the side of the machine. The head angle also can be adjusted by turning the adjuster knob. To ensure the safety, LOS series is standard equipped with the emergency stop switch and disconnection alarm in the event the heating element is disconnected. Optional Tension Arm and the hot stamp printer FEP-A can be installed.